Today, I tackle the important but difficult task of explaining why “gene for” idea is wrong and how to think in a more sophisticated manner about the way genes affect phenotype. One often hears news reports about discoveries of a “gene for X”, e.g., gene for alcoholism, gene for homosexuality, gene for breast cancer, etc. This is an incorrect way of thinking about genes, as it implies a one-to-one mapping between genes and traits. This misunderstanding stems from historical precedents. The very first genes were discovered decades ago with quite primitive technology. Thus, the only genes that could be discovered were those with large, dramatic effects on the traits. For instance, a small mutation (change in the sequence of nucleotides) in the gene that codes for RNA that codes for one of the four elements of the hemoglobin protein results in sickle-cell anemia. The red blood cells are, as a result, misshapen and the ability of red blood cells to carry sufficient oxygen to the cells is diminished. Due to such dramatic effects of small mutations, it was believed at the time that each gene codes for a particular trait. Today, it is possible to measure minuscule effects of multiple genes and it is well understood that the “one gene/one trait” paradigm is largely incorrect. 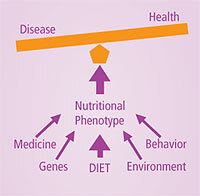 Most traits are affected by many genes, and most genes are involved in the development of multiple traits. A genome is all the genetic information of an individual. Each cell in the body contains the complete genome. Genomes (i.e., DNA sequences) differ slightly between individuals of the same species, and a little bit more between genomes of closely related species, yet even more between distantly related species. Exact DNA sequence of an individual is its genotype. The collection of all observable and measurable traits of that individual is phenotype. If every position and every function of every cell in our bodies was genetically determined, we would need trillions of genes to specify all that information. Yet, we have only about 26,000 genes. All of our genes are very similar to the equivalent genes of chimpanzees, yet we are obviously very different in anatomy, physiology and behavior from chimpanzees. Furthermore, we share many of the same genes with fish, insects and even plants, yet the differences in phenotypes are enormous. Thus, it follows logically that the metaphor of the genome as a blueprint for building a body is wrong. It is not which genes you have, but how those genes interact with each other during development that makes you different from another individual of the same species, or from a salmon or a cabbage. But, how do genes interact with each other? 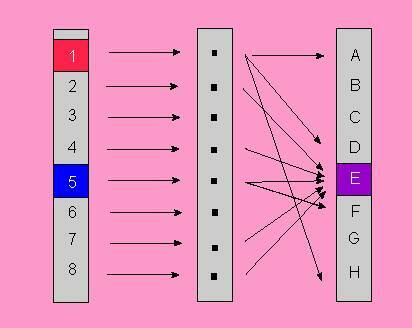 Genes code for proteins. Some proteins interact with other proteins. Some proteins regulate the transcription or replication of DNA. Other proteins are enzymes that modify other chemicals. Yet other proteins are structural, i.e., become parts of membranes and other structures. A slight difference in the DNA sequence will have an effect on the sequence of RNA and the sequence of the resulting protein, affecting the primary, secondary and tertiary structure of that protein. The changes in 3D shape of the protein will affect its efficiency in performing its function. For instance, if two proteins interact with each other, and in order to do so need to bind each other, and they bind because their shapes fit into each other like lock and key, then change of shape of one protein is going to alter the efficiency of binding of the two. Changes in shapes of both proteins can either slow down or speed up the reaction. Change of rate of that one reaction in the cell will have effects on some other reaction in the cell, including the way the cell reacts to the signals from the outside. Thus genes, proteins, other chemicals inside the cell, inter-cellular interactions and the external environment ALL affect the trait. Most importantly, as the traits are built during development, it is the interactions between all these players at all levels of organizations during development that determine the final phenotype of the organism. The importance of the environment can be seen from the phenomenon of the norm of reaction. The same genotype, when raised in different environments results in different phenotypes. Furthermore, different genotypes respond to the same environmental changes differently from each other. 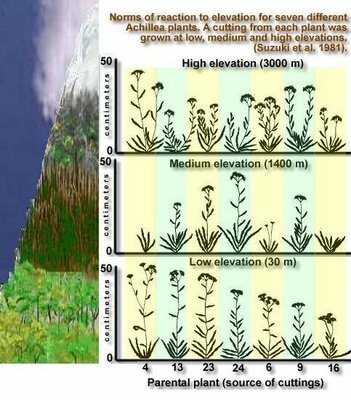 One genotype may produce a taller plant at higher elevation while a slightly different genotype may respond quite the opposite: producing a shorter plant at higher elevations. Imagine that a cell is an airplane factory. It buys raw materials and sells finished airplanes. How does it do so? The proteins are the factory workers. Some of them import the materials, others are involved in the sale of airplanes. Some guard the factory from thieves, while others cook and serve food in the factory cafeteria. But the most important proteins of this cell are those that assemble the parts of airplanes. When they need a part, e.g., a propeller, they go to the storeroom (nucleus) and check the Catalogue Of Parts (the DNA), and press the button to place an order for a particular part. Other proteins (storeroom managers) go inside and find the correct part and send it to the assembly floor (endoplasmic reticulum). But, protein workers are themselves robots assembled out of parts right there in the same factory, and the instructions for their assembly are also in the Catalogue of Parts (DNA) in the nucleus. How do you wear your genes? (PDF) by Richard Dawkins. An analogy for the genome by Richard Harter. It’s more than genes, it’s networks and systems by Paul Myers. I’ve been reading your lectures. I know too little to formulate questions but I’ve been enjoying your work immensely. I’m guessing that your students have this available but for those of us who do not have that good fortune, a glossary would be helpful. You go from coding regions being conserved to variation in protein interactions as being a key to explaining morphological diversity. In particular, these affect the binding sites of transcription factors (for a lay audience: proteins that control when genes are used and what [cellular] events they respond to).